Flashing as they catch the light, long silver earrings are dramatic accessories that never fail to draw attention. There is a huge range of long silver earrings available to women, and different styles can be used to create different effects. A sleek and shiny set of long earrings can create a sophisticated look, while long, dangling earrings can be dramatic accessories for evening wear. A fun and funky set of long silver earrings with lots of beads might go well with a more creative, artistic look. For those with more than one ear piercing, long earrings can be worn along with a small drop earrings for an interesting contrast. There are earrings that are quietly attractive and others that shout, "Look at me!" 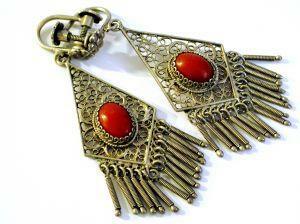 The myriad styles means all sorts of personalities are drawn to fashionable long silver earrings. Long silver earrings can often be purchased as part of a matching set of jewelry, to help create a pulled together look. Many times a necklace is available with a pendant that is the exact twin of the earrings, and rings and bracelets will have design elements that match those of the earrings, such as the same gem or the same engraving of a flower. A matched set of silver jewelry makes it easy to accessorize an outfit, looks great and makes a wonderful gift. To show off long silver earrings to best advantage, make sure they are not covered by hair. These earrings work well with short hairstyles, hair pulled into an updo or hair drawn away from the face in clips, barrettes or ponytail holders. Clean silver with a mild detergent and warm water, and rub dry with a clean cotton cloth. Prevent tarnish from forming on silver earrings by storing them in an airtight container or in tarnish proof bags, available online and at jewelry stores. Plastic ziplock sandwich bags work well too. To remove tarnish, use a liquid, cream or polishing cloth specifically made to be used on silver. Use a clean, soft cotton cloth to apply liquids and creams. Paper towels can be too rough and scratch the silver. A soft toothbrush can be used along with silver cleaners to remove tarnish from grooves and hard to reach places. Be aware of the cleaning requirements of any gems on your earrings. For example, being submerged in liquid can cause marcasite to fall out. Other stones can be damaged by cream cleansers, so make sure to check first. Do not wear silver earrings in a swimming pool, since the chlorine can be too harsh. With just a bit of attention, your silver jewelry will be looking fantastic for years to come. If you're seeking silver earrings, you won't have to look far, since these versatile accessories are popular and easy to find. A trip to the jewelry counter of your favorite department store will likely turn up several choices. For a more bohemian look, try quirky gift shops. When the weather is mild head to art fairs, which often feature booths of talented jewelry artists selling their one-of-a-kind creations. There are also a gazillion online stores that sell stunning long silver earrings - just run a search on your favorite search engine.